Well, I now have a green boat, but not because of the curing epoxy, but it is still pristine resin distribution mesh behind a floppy vacuum bag. Long story short, for the first time in my project the vacuum infusion failed, or better said, I could not run the infusion because of two persistent leaks from the inside in the aft beam area. But don’t worry, it appears to be not a big deal, it only causes slight delay. 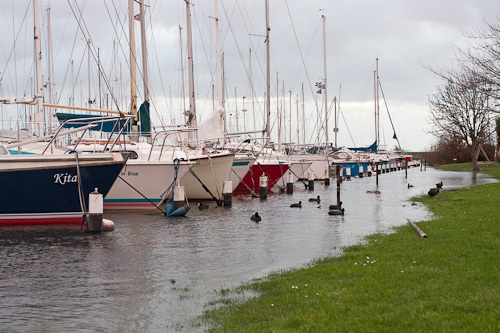 There is a violent storm going on and some areas in The Netherlands are fighting against a extremely high water level, the quay on our garden is flooded and my car alarm woke me up. The storm activated the motion sensor of the alarm system in the car. O well, it will be a busy day today, so better get up early. I receive an email of Arjen Korevaar of www.Polyworx.com containing the infusion strategy and simulation. He worked all night to design a perfect but simple infusion strategy. This comes just in time for me to translate this into the dimensions of the runners. It shows a further development of the strategies I have used so far. Yesterday evening I prepared a fore and aft pleat in the resin distribution mesh for the vacuum line on top of the hull, but that was too premature. 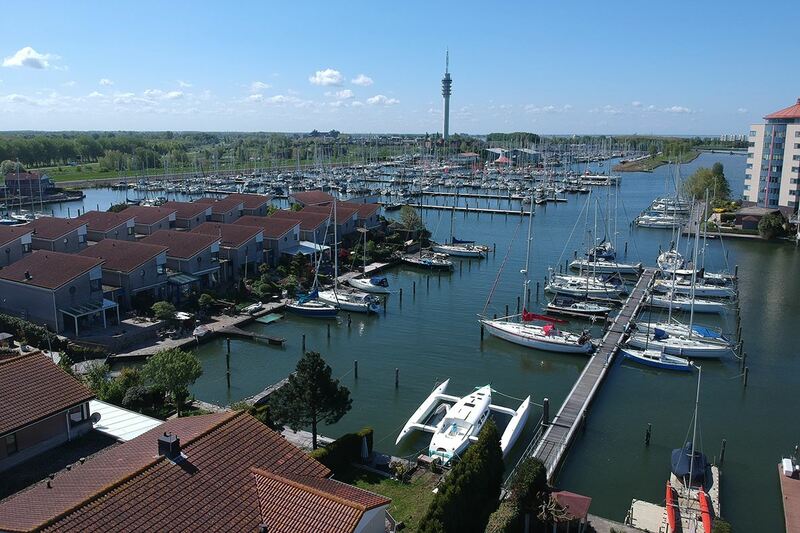 In this new strategy there are only some single venting ports, just ingenious. It is still no winter and the heater is able to heat the workshop to a level of about 20ºC. Yesterday I’ve put the resin in the canteen with the heater high at a temperature of about 23ºC. But before going to work on Fram I have to finish some business things at the office. 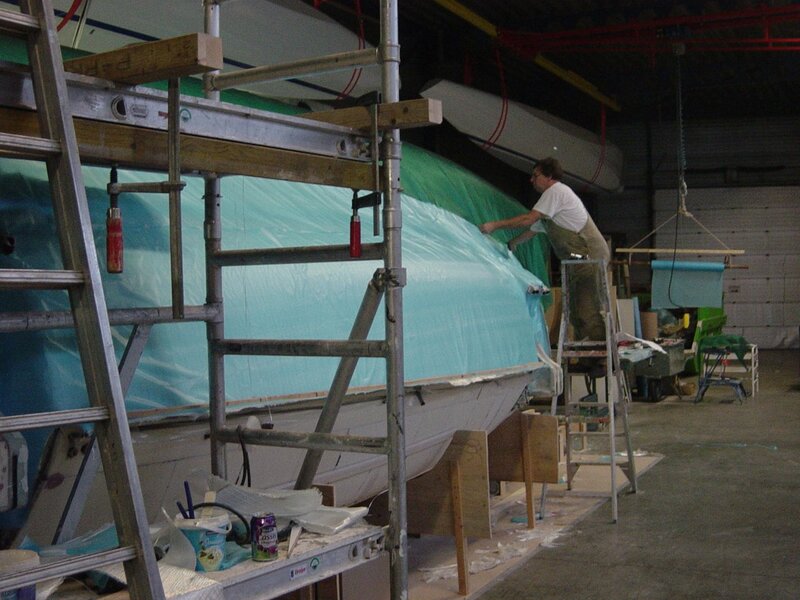 The planning for today is fixing the resin distribution mesh, the resin feeder lines, the venting ports, the vacuum bag and putting the whole hull under vacuum. I prefer to let the vacuum alone during the night from Thursday to Friday. The vacuum infusion is planned tomorrow Friday 10.00 AM. and I will be assisted by some helpers including Arjen. Still busy with the green resin distribution mesh. I still have to buy some PVC parts for the resin traps, 1″ tube and two valves for the resin feeding line. A colleague of mine was kind enough to do that for me. It looks to become late this evening, so I phone my wife that she don’t have to count on me for supper. At 10 PM , the building alarm must be enabled and I phone the security company that enabling the alarm is not possible because I’m still at work. I also phone my wife again saying it will be very late tonight and she don’t have to wait for me. Yesterday I tested cheap insulation foam to see if it was not eaten up by epoxy resin. That seems to be not a problem and I now cut the venting ports out of this insulation foam. I feel annoyed because it looks that I don’t have enough time to get the hull under a vacuum for several hours. Finally the resin distribution mesh is done and all the spiral tubes are in place. 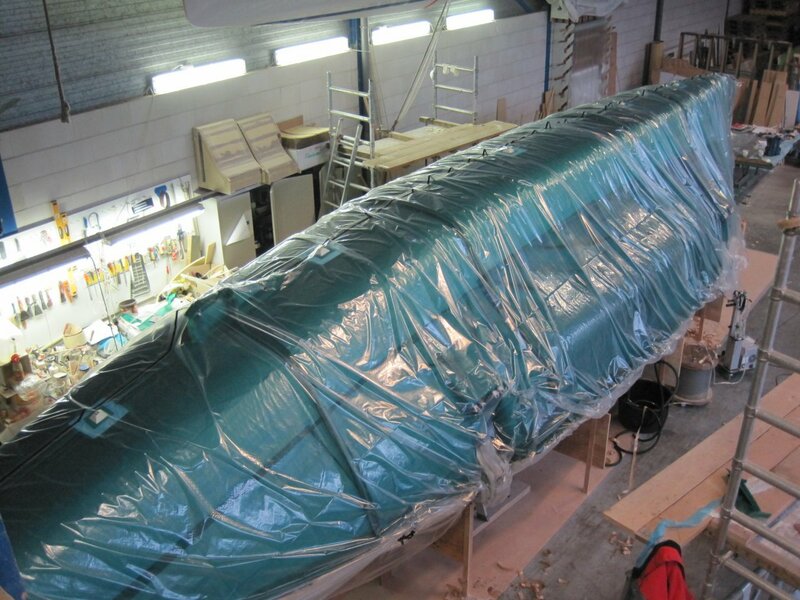 I prepare two pieces 53’x10′ of vacuum film and put them together to form a 53’x20’m sized vacuum bag. That must be enough to cover the 39′ hull. 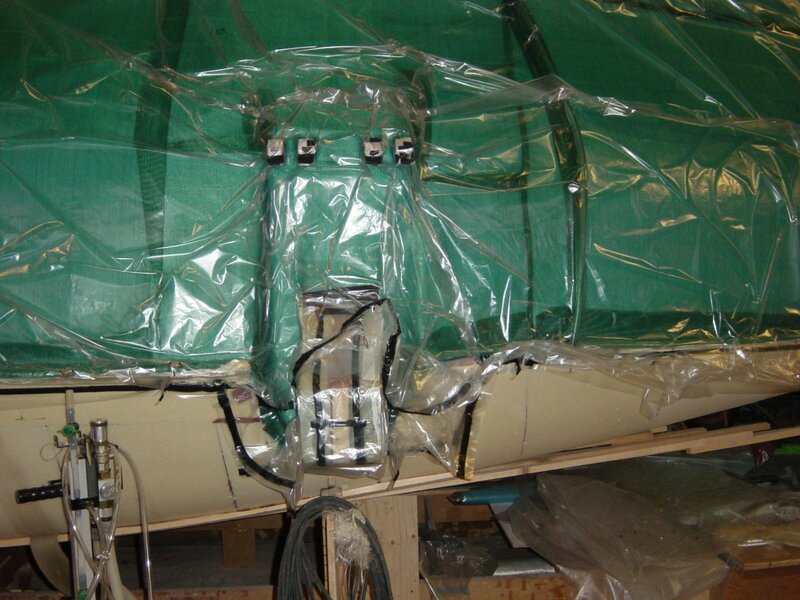 In the area of the fore beams the vacuum bag is too short and need a 5’x3′ extension. The second try of this extension does the job. 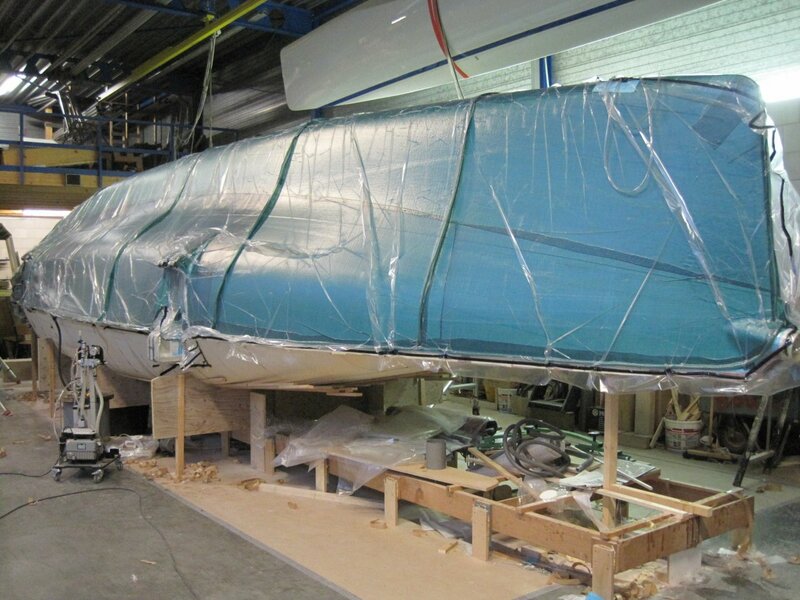 It looks that the vacuum bag in the area of the aft beam is just wide enough, so in that place no extensions are needed. Vacuum bag is still not closed, helpers arrive. 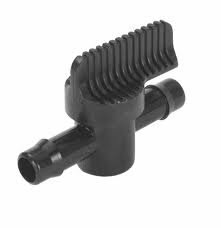 It appears that the plastic valves are not airtight in the closed position. These valves are a bad buy and have to be replaced by the brass ones I normally use. However, I don’t have them and make a temporary seal with some tacky tape and vacuum film. So a total thickness of 33mm. The temporary screws were 30mm, so in theory there is a 3mm play above the screw point. Now what if the screw was driven to deep in the wood with the screw point just in or above the foam surface. Apparently this has been airtight during the resin infusion of the internal laminate, but leaves a very small hole after removing the screw. This is the only explanation I can think of. And there are some holes from the inside in the bow tube area. But that is a result of my own stupid fault as I’ve used some temporary screws there without noticing I punctured the internal laminate with them. The vacuum is still not more than about 15″Hg, caused by two leakages in the aft beam area and these seems to come from inside as well. The only way to fix that is to give the sealant tape of the vacuum bag an alternative route. But by now a jetlag feeling is overwhelming me. The alteration of the vacuum bag and putting vacuum on again will take at least another three hours and together with the infusion and geltime requires another 14 hours of me to stay awake. Saturday and Sunday I have other (family) obligations so it is not wise to go on. But now that I know the cause of the malfunction it is easier for now to give up. 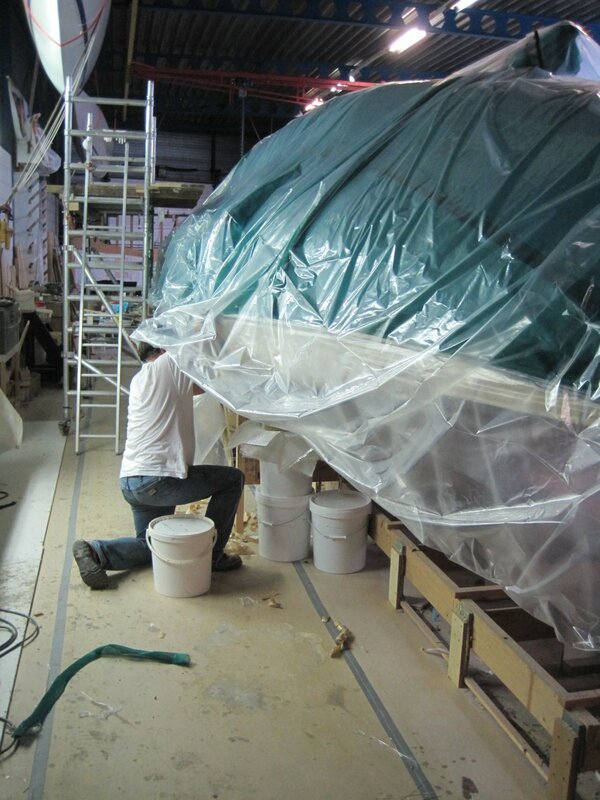 Boatbuilding with the mind to infinity. Before laying up the external laminate, various “small” other jobs has to be done. Every time it is amazing how a relatively small job takes much more time than expected. For example the beam recess on the outside of the beam bulkhead. For cutting this recess area to size and removing superfluous foam hull parts I needed all the cutting and sanding tools I have, jig saw, reciprocal saw, multicutter tool, dremel tool, powerfile, belt sander, angle grinder, powerplane and the handtools like chisels, grater, hammer, file, multiknife, sandpaper, etc. and this all within 5 square ft . The four beam recesses took me two days with a lot of itch (from the glass dust) as a result. Then some foam fill pieces, which took another whole day, one day for the UD reinforcements and another four (?!) 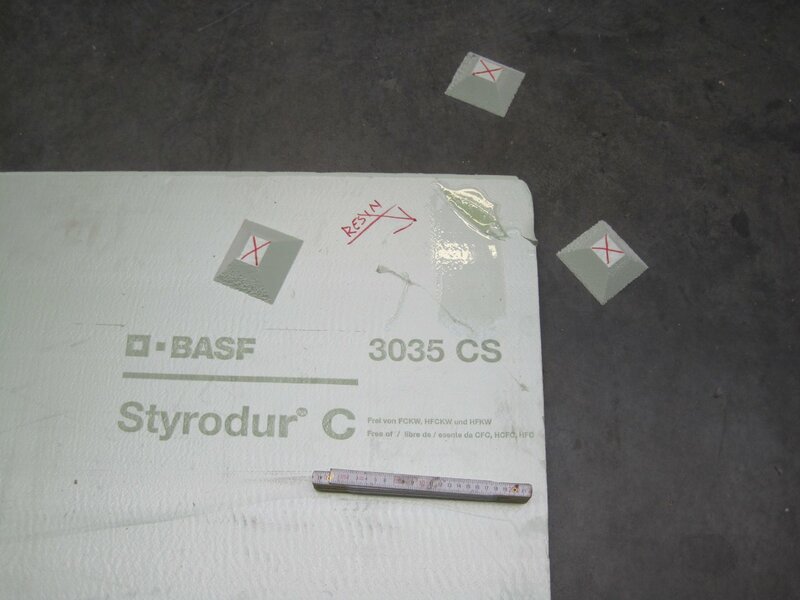 days for rebating the foam and preparing the whole area for further laminations. Everything is taking at least three times longer then expected ….. 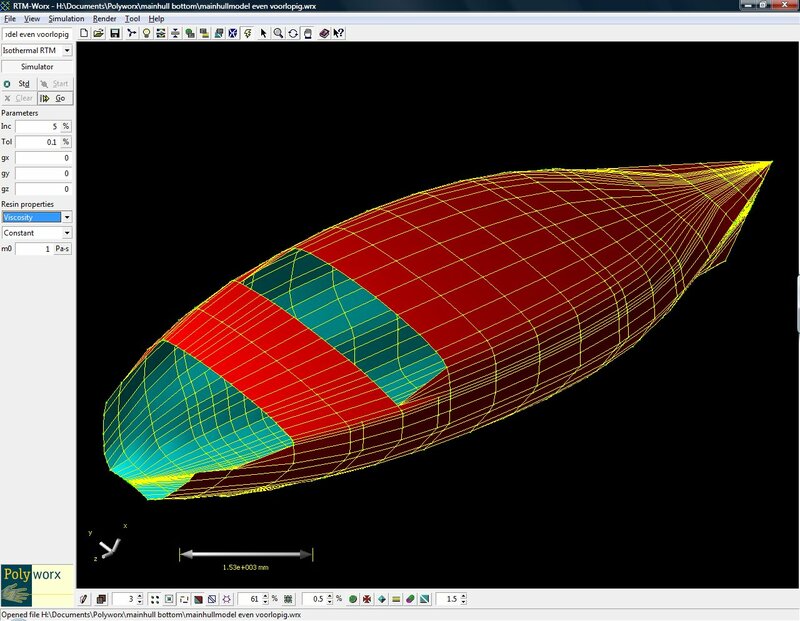 So far I made three computer flow simulations, the inside of the floats, the outside of the floats and the inside of the main hull. Actually, the developer of the RTM-Worx flow simulation software, Arjen Korevaar of Polyworx, made them and I only did the dumb data input. Anyhow, last time was somewhere in 2007 and now I have to learn the simulation software all over again as I have forgotten all about it. However, if all goes well I must be able to convert the existing 3D model of the port main hull half into a lower (bottom) hull half and an upper (deck) hull half. Next is the input of the various fabrics attributes and then the model is ready for Arjen to determine the runner placing and sizes. I still have two simulations to do, both outside main hull. 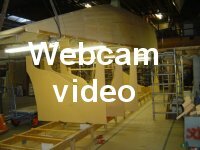 First the bottom part and second the deck part after which the virtual boatbuilding regarding the boat hulls is finished. In the mean time I am fairing the foam hull, filling the outside of the joins with bog and laminating extra reinforcements around the beam bulkhead flanges. Outside float laminate in one infusion shot. Click on the animation to enlarge the animation of the simulation of the outside laminate. I received a lot of questions about the area were the hull rest against the cradles. 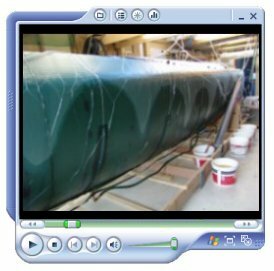 The thought is that the weight of the hull will disturb the epoxy flow by producing a compression force in the laminate. Well, this is only a (small) problem in the dry condition to keep the fabrics in their positions. During the infusion the vacuum pressure is 1 kg/sqcm (this is 10 ton/sqm) and this force will overrule the weight completely. The epoxy flow is in not any way influenced by these supports. And here is the video of the float infusion. On the CVI page you can find more infusion videos.